Blue in Green is the third track on Miles Davis’ album ‘Kind Of Blue’ which is the best-selling jazz album of all time — worth checking out if you haven’t already. The form of Blue in Green is very unusual. The 10-measure form is much shorter than most jazz standards and so it’s repeated numerous times in a performance. In this lesson we explore and apply altered harmony. 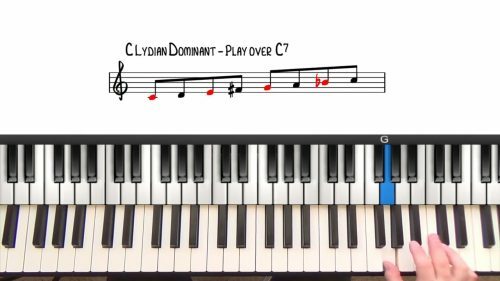 This tune is great for learning altered harmony because the melody contains many of the interesting upper extensions and alterations. The altered contains every possible altered chord tone and is a great scale choice to improvise over altered dominant chords. 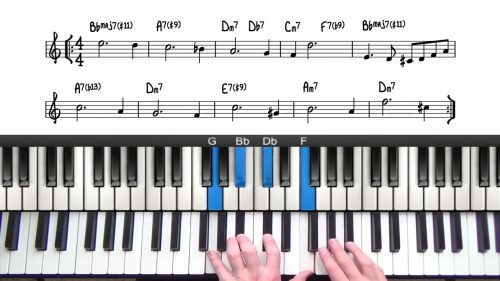 The melodic minor is an exotic sounding scale and the modes of the melodic minor are used extensively in jazz improvisation. 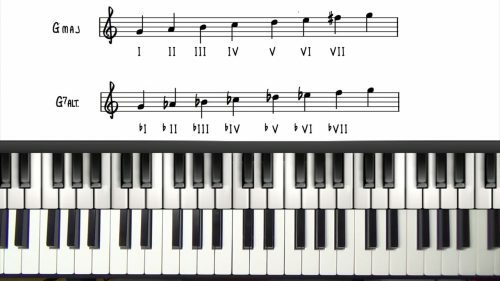 Analyse the melody notes in terms of scale degrees. You will notice that lots of upper extensions and alterations are covered in the melody. Learn and memorise the altered voicings covered in this tutorial. Check out the many Bill Evans recordings of this tune for additional inspiration.